Our Affiliates Program is a great way for you to earn money by selling stories that you submit to our Writing for the Soul Workshop™. We provide you with five-star support to help you every step of the way. Ages 7 & up! Step 1. Use the Contact Form below to submit a story. You’ve got amazing writing inside of you. Uncover it! Discover it! You have permission to explore, fail and soar to writing abilities you never thought you had! Don’t worry about mistakes! Step 3. Make money promoting your story from your favorite device! Click here to see an example of what your story will look like. 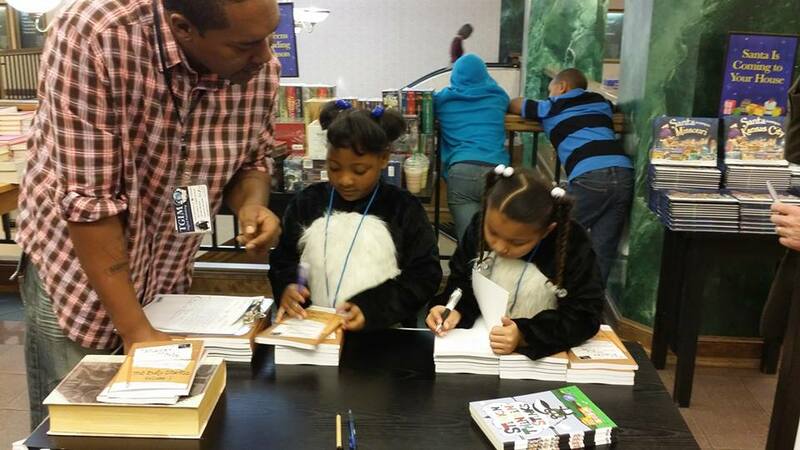 D’Vyne(center) autographs copies of The Bully Diaries 1st Edition at Barnes & Noble on the Plaza in Kansas City. One day I was at school. I was playing with my friend. There was a girl who bullied me. She pushed me. My friend had my back. She helped me. The next day, we was outside playing. The girl who bullied me pushed my friend. I helped my friend up, and we went to tell the teacher. Our bully got in trouble, but kept bullying us until the end of the day. Once your story is submitted, you will receive detailed training and customized marketing blurbs, making online sales for you EASY! Want to start earning money? Use the 3 easy steps above to get started today! All ages welcome to participate regardless of ability. Well, what are you waiting for? Let’s get started! Please do not submit stories that contain any of the following: obscene or explicit material, unnecessary profanity, vulgarity, or inappropriate or graphic love scenes. Any material considered for publication that is found to be graphic will require a mandatory edit of the material and may result in a rejection of the material. Please note that we do not publish graphic material. Therefore, you may be asked to remove graphic material or language. YOU DO NOT HAVE TO SHARE YOUR STORY TO EARN MONEY AS AN AFFILIATE WITH US. In the ‘Your Story’ box below type: “I do not want to share my story.” Simply join our program and promote the stories submitted by members of our Writing for the Soul Workshop™ program. It’s Global Entrepreneurship Week! How many streams of revenue do you bring in? You need at least two. If you don’t, then consider earning money from your smartphone promoting positive & encouraging eBooks by Writing for the Soul Workshop™. It’s free and easy. All ages welcome regardless of ability. Tell a friend!